I find that meeting people who share your passion wonderful. Meeting someone who shares your passion, has sewn practically everything, lives by you and is supportive of you is pretty much a needle in a haystack. But I'm here to say that it happens. I have a friend and mentor that is an insanely amazing woman. Leena has been around the sewing block. Lately when I've sewn something, I show her or I plan projects and get her input. I like getting her input because she gives me ideas for how to do this or that differently or maybe try this sewing technique or gives me her thoughts on color choice and style. Leena is one of those types of people that would literally give you the shirt off her back if you needed it or probably if you didn't need it too. She's given me a TON of fabric from her amazing stash and then one day, she invited me over to pick out yarns because she wanted to weave me some fabric too. I know, I know! This is crazy, but yeah, these photos are of some fabric that she wove for me. Like on a loom with her bare hands and all. I really have no concept of how to weave fabric except to say that its pretty much magical and this is pretty much one of the nicest, most thoughtful gifts anyone has ever given me. Amazing, right? I feel pretty spoiled and am quickly brainstorming a jacket to make out of it. Chanel style, cardigan jacket I think. What do you think? Do you have a sewing mentor in your life? Wow, thats a lot of luck you have there :) Sadly, apart from you amazing sewing bloggers, I sew pretty much in a vacuum, so a sewing mentor would be an absolute dream. Such beautiful and precious fabric, I think it's asking for a Chanel style jacket that you will keep forever. what a beautiful piece! i would love to learn to weave but i just don't have the time right now. This is such an amazing, beautiful gift!! What a treasure of a woman! I think the fabric would look amazing sewn up in a chanel style coat! Bog jacket. (Threads magazine has articled this at least once. I'm sure they're not the only source.) Takes the fewest cuts, uses an entire rectangle of fabric. The fit is loose and drapey, though, so you may not care for it. The cut is ancient, the fabric waste is zero, and there's scads of room for embellishment. Wow, that is gorgeous! What a sweet and thoughtful gift! I love the idea of a Chanel style jacket, that's such an iconic piece on it's own, even better with such a special fabric. What beautiful fabric! I am fortunate in that I have two sewing mentors. They are constantly helping me with my sewing and never get tired of me talking about sewing. They're awesome! Oh, Sunni what a special gift. The fabric is lovely and you are going to cherish the jacket you'll make from it for life. 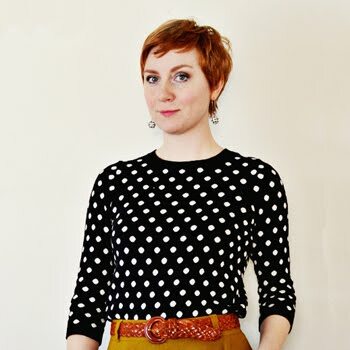 I don't have a sewing mentor, but as a result of participating in your Ginger sewalong I've made a blog friend (whom I've become quite close with despite the fact that we do not live in the same country!) who shares my interest in sewing and knitting. We've met in person and are even planning a sewing holiday together. It's great to have friends to share our hobbies with! What a special gift! The fabric is beautiful! That fabric is unbelievably beautiful! You certainly are a lucky girl :) I also think a Chanel-style jacket or something else simple and classic (like a sheath, maybe?) to really accentuate that lovely fabric! That is gorgeous, gorgeous fabric! This is beautiful and I can't think of a better use for it. My Mum is my sewing mentor, I might have to persuade her to take up weaving! What a lovely friend and fabric! I think your Chanel idea is spot on! My Grandmother mentored me through my first several sewing projects and still provides input over skype at times. I have two lovely ladies that I go to in the community when I'm stuck with a problem. Getting another's opinion or fresh view of a project is very helpful. Wow. STunning fabric! I'd be too scared to cut into it! I think your jacket is a great idea. It's the perfect sort of fabric for that! Leena, if you take a glance at this, my hat is off to you. :) That woven fabric.... wow! Sunni, I love that you've found her (or maybe she found you) and I think a Chanel sytle cardi jacket would be perfect! Cant's wait to see what you make. That is so beautiful! I'd be so afraid to even touch it with scissors! I'm glad you are brave enough for it. A Chanel jacket sounds marvelous. Sewing mentor? Since my mom died ten years ago (as of yesterday), I'd have to say my mentors are the amazing Sunni, Gertie, Ruth, Laura Mae, Peter and Novita, to name a few. And I'm very glad to have them. Wow that is incredible!! I just wrote about how the sewing community is truly the best, most supportive group out there. This just proves my theory right. The fabric is absolutely amazing, a work of art really. I'm dying to see it made into a jacket. Just beautiful. Wow! That looks amazing! Can't wait to see it as a jacket. My aunt and cousin both sew, and my sister took fashion in post-sec, so I suppose they are who I turn to first! Amazing fabric... and done by hand! I must admit, I'm totally ignorant of the weaving process, but I can't imagine it's straight forward or everyone would be doing it. Flabbergasted! Wow. I'm blown away by your post on oh so many levels! First... well, I'm actually not sure what I'm blown away by first, but a list has to start somewhere, so first, the woven fabric itself is unbelievably stunning. Second, that it was handwoven with yarn you got to choose, and third, Leena's generosity is clear. But last, and this is what I'm most blown away by, is that you have a mentor, and such an amazing one at that! I dream of having a mentor for my sewing. Truly lucky, you! Beautiful fabric. I'd definitely go for a Chanel style jacket - I love the February Burda cover jacket. And count yourself lucky to have a sewing mentor. I need one! That is amazing! The fabric is absolutely beautiful. What a thoughtful gift. Chanel style jacket, for sure. It'll be gorgeous! Wow! How cool! What an awesome gift! 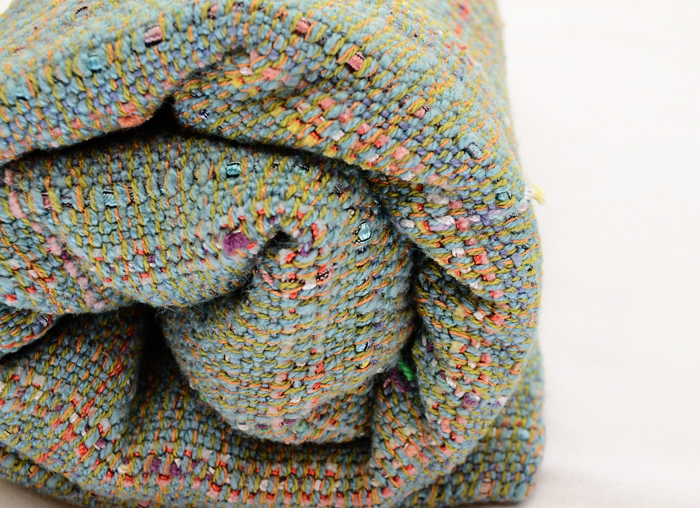 What an amazing fabric, and what a great use for leftover (or brand new) yarn! This makes me want to learn how to weave. While I look up to many bloggers for tips and inspiration and use family and friends as sounding boards for projects, I'm sadly without a true sewing mentor. All of you amazing sewing bloggers are my mentors! The person that I see IRL is Christine Haynes, because she works at SewLA. I would have to say she is a great mentor, always so supportive! That woven fabric is so amazing, I would be afraid to cut into it. I think that a jacket would be divine though. That's a really beautiful fabric. 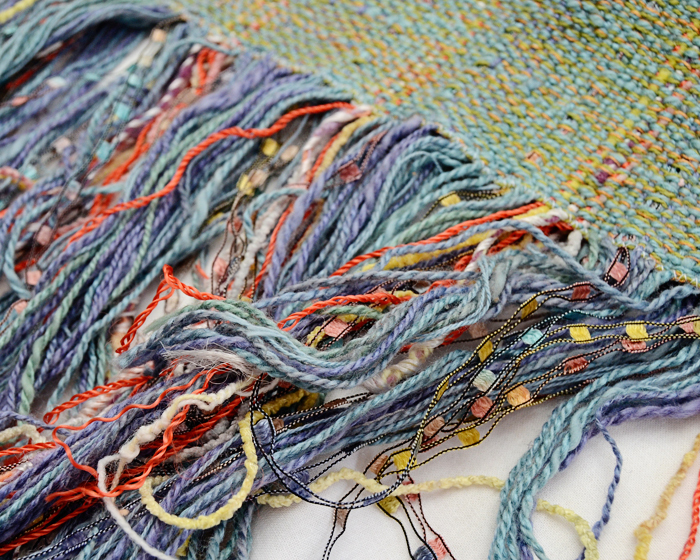 The ladder yarn (the one with little squares of shiny colour), is one of my favourite yarns to use in weaving. A Chanel style cardigan jacket would be PERFECT!!! Have you thought about doing a jacket sew a long since you've been knocking them out left and right these days? Leena is such an amazing resource - I'm jealous you have her as a mentor! I had no idea she weaved too! That fabric is gorgeous. I vote yes on the Chanel jacket. Wow this fabric and the story behind it are incredible! A jacket's a great idea - you'll be able to wear/love/cherish it forever. Can't wait to see what you come up with! I was just talking to my cousin about finding a mentor. That would be awesome! 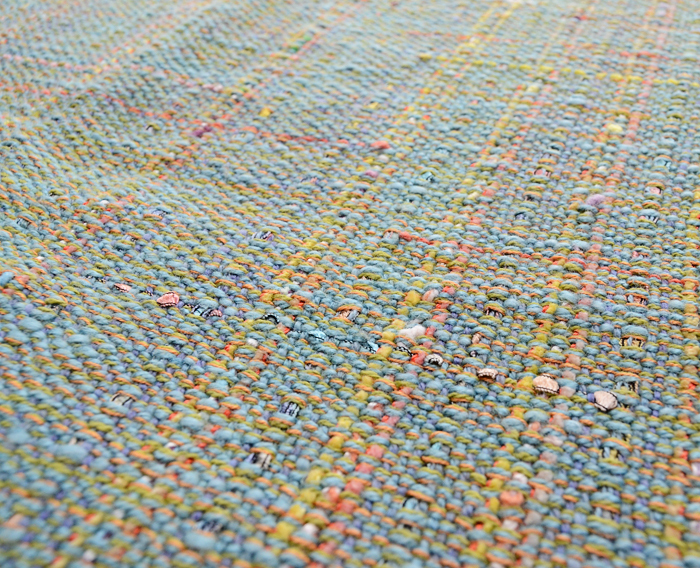 This is beautiful fabric, it will make an amazing chanel jacket!